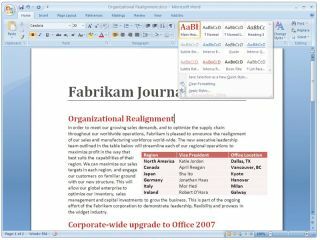 At the moment one piece of word processing software dominates the market: Microsoft Office Word. Word has been through many incarnations, and with the latest version the designers have gone back to the drawing board and attempted to give customers what they really want: an application that they can use to create documents without wading through menus to locate a feature. This has been a relative success, but if your writing is specialised, you need to write in a language other than English or you're just strapped for cash, there are many alternatives available. The biggest drawback with Word is that it can be expensive when bought as a standalone application or as part of Microsoft Office. However, a superb alternative called OpenOffice has been developed by the open source community. The Writer component of this suite now has a feature set that's comparable to Microsoft Word, but is completely free to download. Multilingual versions of Word exist, but if you're looking for a dedicated word processor that can handle non-Latin alphabets, Global Writer and Universal Word 2000 support right-to-left languages such as Arabic and Hebrew, as well as dozens of other languages. Dagesh Pro IV is a specialised Hebrew-English word processor that runs with all versions of Windows. If you're a Mac user, Nisus Writer is a well-developed multilingual word processor for the Mac OS. You can buy multilingual word processors from Languagesource, as well as keyboards to match the language of the word processor you're using. The layout of complex scientific notation is usually the province of high-end apps like FrameMaker, but there is a specialised word processor that can handle this task with ease. LaTeX, based on the Tex system, is a typesetting program that gives the user incredible control over every character's position on the page. If you lay out newspapers or magazines and use InDesign, then the InCopy word processor is a superb application that integrates into your InDesign workflow. Budding film and television screenwriters have a number of specialised word processors to choose from, including Sophocles and Screenplay. Novelists, too, are spoiled for choice when it comes to customised word processing. Often, the applications will be basic word processors with a whole raft of add-ons that writers might find useful, such as character profiling and plot anatomy. Packages that are worth trying out include Power Writer, Dramatica Pro, NewNovel, and Liquid Story Binder. If you're a Mac user, check out Avenir, which is quickly gaining a loyal following among writers. Online word processors have proliferated over the last couple of years, but the market really got started when Writely appeared. This is now a component of the Google Docs suite of applications. Others soon joined, including Zoho, which is now part of a complete online office suite that even has a Word plug-in, so you can save your files directly to Zoho's servers for online editing. There's also ThinkFree, Nevrocode Docs, FlyWord and Docly, which has the ability to automatically assign copyright protection to your documents. Web 2.0 is also impacting the online word processing market. AjaxWrite takes the application design philosophy of Web 2.0 to offer an office suite that seamlessly integrates with your Firefox browser. The word processor is now ubiquitous and with the Internet opening a new facet to how we create and edit words, whether you need to bash out a simple letter or write a bestselling novel, there's a word processor that's ideal for you. Final Draft has been the standard in scriptwriting applications for several years, with many industry luminaries singing its praises. These accolades are well deserved, because the application is not simply a specialised word processor but a complete writing aid to help you become a writer for the small or big screen.